Reduce and Refuse, Recycle and Replace – the Plastics Roadmap for Finland points out the first steps towards a new, sustainable plastic economy. The Plastics Roadmap identifies measures used to reduce the harm caused by plastic waste and litter, help consumers deliver plastics to waste management, improve the efficiency of plastics recovery, recycling and product design, creating conditions for investments and innovations in the circular economy, and reducing the dependency on fossil raw ingredients by increasing bio-based and biodegradable solutions. The implementation of the Plastics Roadmap has started while some of the measures need a longer time to be implemented. As awareness on the topic grows, there is also a need for new measures. The Finnish Ministry of the Environment organizes the follow up and networking and encourages for co-operation by a platform for knowledge exchange, plastics network, plastics forums and team workshops. Citizens’ Plastic Track is part of the network. 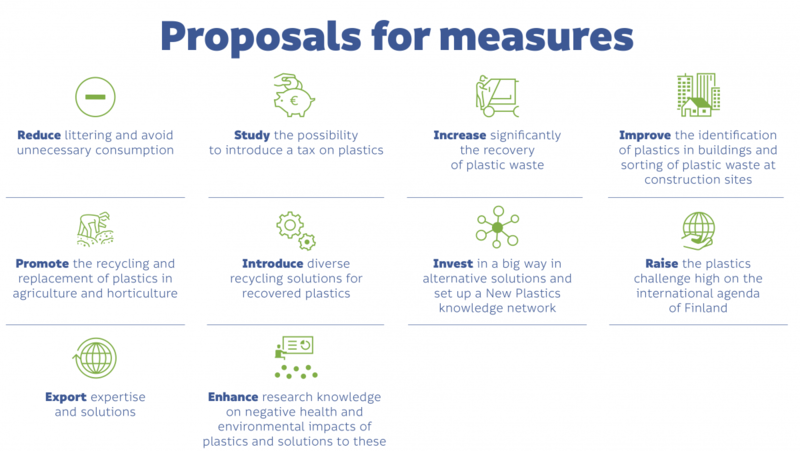 A broad-based working group – supported by a secretariat composed of experts and the open web ideas by the citizens – prepared the Plastics Roadmap. A large group of stakeholders also participated in the preparatory work. Implementers and partners: ministries, cities and municipalities, waste management companies, producer responsibility organisations, Finnish Plastics Industries Federation, VTT Technical Research Centre of Finland, NGOs (like Martha Organization, WWF Finland), Finnish Environment Institute, Confederation of Finnish Construction Industries, Finnish Plastics Industries Federation, Association of Finnish Local and Regional Authorities, KEINO Competence Centre for sustainable and innovative public procurement, Sitra, Business Finland, Finnish Forest Industries Federation and other industrial associations, Academy of Finland etc.